Neuilly-sur-Seine, France, March 16, 2014 – Leading international classification society Bureau Veritas is to class a unique LNG-fuelled high speed and high capacity passenger ferry which has been ordered by AS Tallink Grupp for the Helsinki-Tallinn route. 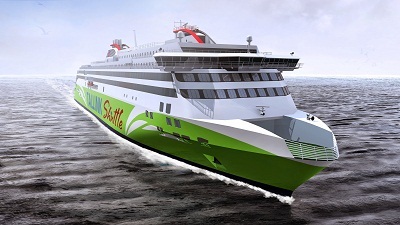 The 2,850-passenger vessel will have a service speed of 27 knots and will be built by Meyer Turku for delivery in 2017. The 49,000 gt ferry will be 212 m long. The dual-fuel vessel is designed to operate in icy waters and for fast cargo and passenger turnaround at each end of the route. Bureau Veritas subsidiary Tecnitas has already carried out risk assessment studies for the LNG bunker operations in Helsinki and Tallinn ports. Bunkering will be carried out in either port by truck or bunkering barge. Tecnitas will also carry out HAZID studies for the proposed LNG propulsion and storage on board.